So, I've been experiencing some huge Tower moments in my life lately, and it's driving me to make some big changes. I'm feeling like the Pagan New Year was and is a huge turning point in my life, a rebirth if you will. I let go of a huge part of my past that was hanging over me and started living differently. BUT, nowadays, I rarely feel like I have time for big life transformations. It's tough, because, my bi-polar tendencies and my creative nature make me want to take on new, big projects and dedicate all my time to them... Then, after a few days, I get bored and move on to something else. This is fantastic for art projects, writing, and other creative endeavors, but not so great for long-term goals and habit forming -- which is really what I need in my life right now. So, I turned to my Tarot cards to see what I needed in order to be most successful at some of my "new life" goals. I focused on two big ones: 1) eating better, and 2) exercising more. Barf. It's not that I don't even like doing those things, it's just that... I get bored and lazy quickly. Instead of breaking these out into 2 individual questions, I focused on general "healthy lifestyle" as my Tarot topic. I think this means the hustle and bustle of work/life. My new work schedule is overwhelming, and it takes up a lot of my mental capacity, which seems drastically reduced nowadays. This card, to me, always means... one day at a time, one task at a time. Eights come after sevens (the faith number), and always remind me that dreams and goals take work. This question comes with some "ifs," so... "If I commit to my life changes and health goals..." I could possibly see results in 5 days or 5 weeks (weeks are more likely), but I might see some minor shifts in 5 days too. Since 5 of Cups is often about disappointment and refusal to see the positive, I'll need to be kind to myself and keep my thoughts and actions goal-focused. The healthier (or more productive, or more focused, or more creative -- whichever goal you're striving for) version of YOU is already in you. You are not "becoming" someone else, you already are that person if you choose to be. I returned to my healthy eating plan on Sunday. So, guess what? I'm a healthy person. In this moment, I am a healthy, active person. Claim that energy, channel that improved version of you. Be him or her now. You're already there, even on Day 1! Make small changes for the sake of forming habits. You don't have to walk 2 miles every day. You can walk around the block. Just get in the habit of going outside every day. Tarot is my Mr. Miyagi, because it reminded me to slow down and make small changes over longer periods of time. 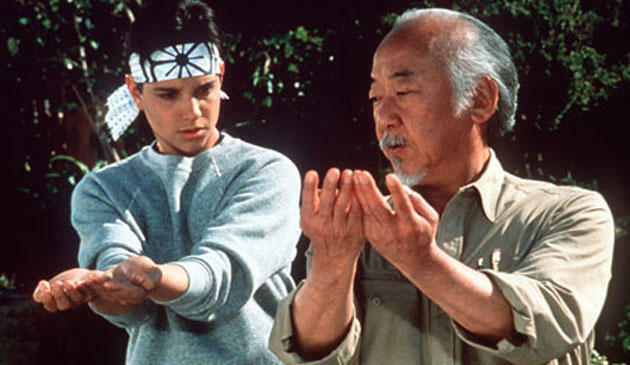 Mr. Miyagi teaches Daniel-san how to make small changes all in the name of mindfulness and forming habits. Be super kind to yourself. Forgive yourself, so you can move forward and keep focused on your big-life goals. Make changes NOW that make you feel like your improved self, so you begin to claim that energy of improvement. If you want to be more creative, keep your creating-supplies nearby. If you want to be more organized, start a planner. Channel the energy of your improved self and/or someone you want to be like. Daniel wanted to learn karate, so he channeled the wisdom of Mr. Miyagi, and you can channel the wisdom of someone who has met goals similar to those that you want to achieve too! Thanks to social media, you can follow the daily lives of lots of folks who are striving to meet similar goals as you! Remember to ask your cards what's blocking your own personal goals and how you can work through those blocks! Free Download - Live, Love, and Make Magic!